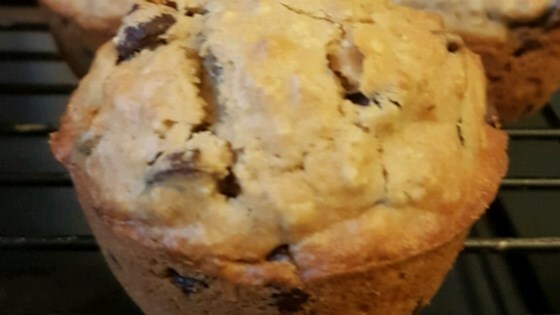 "This hearty breakfast muffin recipes packs chocolate chips and pecans into an oatmeal muffin for extra deliciousness." These turned out great, even though I had no chocolate chips to add. I added about 1/2 tsp. of cinnamon. Love the topping too! Super easy, and super fast, these yummy muffins are a treat. I don't think that waiting 15 minutes makes it an 'extra effort' recipe at all. Gives me time to make my tea and sip it. I especially liked the crunchy top of these muffins. A winner!